2013 will definitely be remembered as the year of asteroids and comets. These smaller objects of the Solar System will capture the attention not only of the astronomy community but also of the general public with breathtaking pyrotechnic figures. To begin with, Earth will have a scary moment on 15th February: the passage of asteroid 2012 DA14, a giant with a diameter of about 50 metres and a mass of 130,000 tonnes. It will be a close shave. In fact, the asteroid will pass just 36,000 kilometres away from the Earth’s surface, inside the orbits of the geostationary satellites, but it will be not pose a threat for our planet. Between March and April the comet C/2011 L4 PanSTARRS will streak past Earth, passing over 50 million kilometres away. 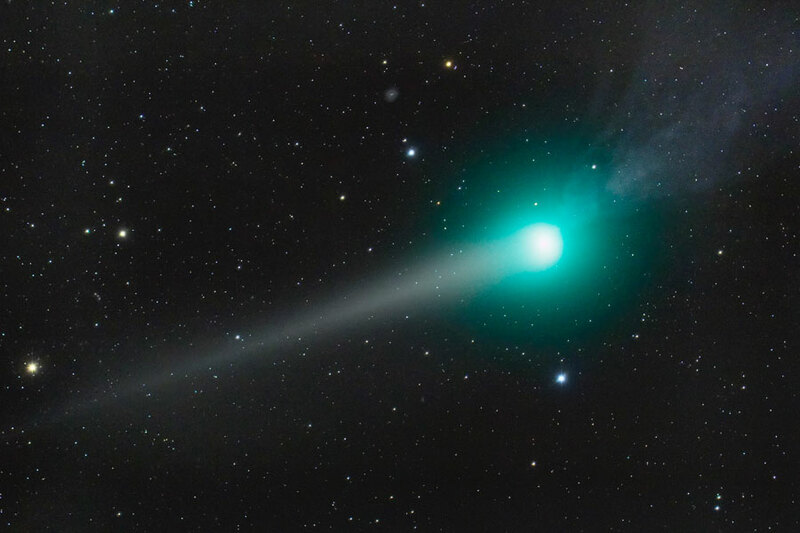 And finally, towards the end of 2013, we will witness an amazing event: the passage of the comet ISON which, according to astronomers, will be the most luminous comet of the century, brighter than the Moon and hence visible even in daylight. In other words, comets will be the superstars in 2013! C/2011 L4 Pan-STARRS is a non-periodic comet, discovered in June 2011 using the Pan-STARRS telescope located on Haleakala, Maui. It was confirmed by the astronomer Richard Wainscoat and by the student Marco Micheli using the Canada-France-Hawaii Telescope on Mauna Kea in Hawaii. The comet has a parabolic orbit, this means that this will be its first and last trip near to the Sun. In March it will reach its perihelion, that is the point closest to the Sun, passing at a distance of about 50 million kilometres from our star (0.3 astronomical units; an astronomical unit is the distance between the Earth and the Sun), approximately equal to the distance between Mars and the Sun. Naturally, due to the great distance, it will not endanger our planet. 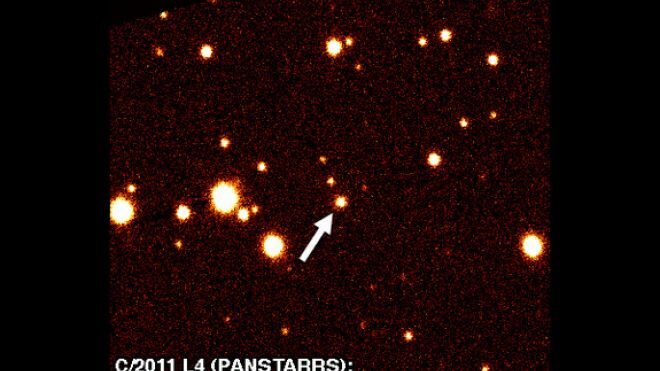 It is expected to be visible to the naked eye, with peak brightness between magnitude +1 and -1, similar to the magnitude of Sirius, the brightest star in the night sky. Researchers at the Mauna Kea Observatory are cautious regarding this last point, because it is notoriously hard to predict the brightness of comets since numerous comets in the past did not meet expectations. What we do know is that it will be visible in both hemispheres, but probably it will be rather low on the horizon in the Northern Hemisphere and might be difficult to spot. But why do comets become brighter near to the Sun? Where do they come from? What are they made of? Let us take one step at a time and try to understand what a comet is. Often it is wrongly defined a ‘guiding star’. However, it does not have much in common with a star, apart from its luminous tail from which it derives its name (kométes, i.e. long-haired). A comet is a relatively small celestial body, similar to an asteroid, but composed primarily of ice. In the Solar System, comets have orbits that extend beyond the orbit of Pluto. Comets that enter the inner Solar System, and therefore become visible, often have elliptical orbits. Comets are believed to be the remnants of the condensation of the nebulous matter from which the Solar System was formed: the peripheral regions of this nebulous matter must have been cold enough to freeze water. The nucleus of a comet, commonly described as a dirty snowball, is composed of rock, dust and water ice. Trapped within the ice is a mixture of frozen gases such as carbon monoxide, carbon dioxide, methane, ammonia and even carbon and sulphur atoms. Sizes can range from hundreds of metres to tens of kilometres. For example, the nucleus of Halley’s comet is ellipsoidal in shape, with a long axis of about 15 kilometres. The Guinness World Record goes to the Hale Bopp comet, which became famous in the spring of 1997 when it became bright enough to be visible to the naked eye. From measurements taken of the quantities of gas and dust released, it seems that Hale Bopp had a gigantic nucleus whose diameter measured around 40 kilometres. Whatever the size of the nucleus, as comets pass through the inner Solar System, the heat of the Sun causes ice sublimation, that is the direct change from the solid to the gaseous state. Actually sublimation occurs only in the sunward-facing hemisphere, as was recently revealed by the EPOXI mission on observing the comet Hartley 2. The release of gas and dust occurs only in the part exposed to the Sun. Vents in the nucleus can be observed, from which the gases that form the coma are released. 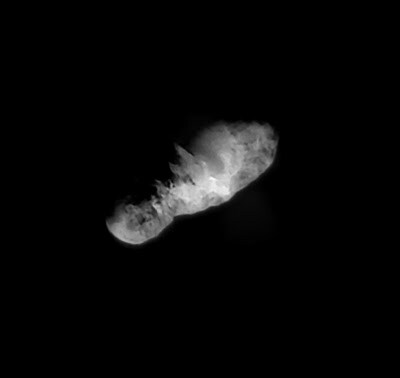 An image of the nucleus of the comet Hartley 2 taken by the EPOXI mission from a distance of just 700 kilometres. Even though it is generally believed that comets are bright, a comet’s nucleus is one of the darkest objects in the Solar System. 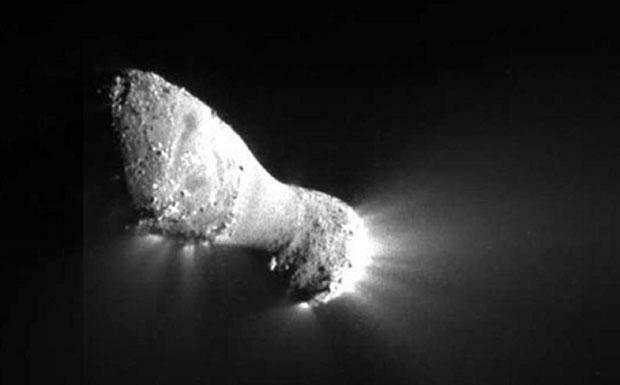 The Deep Space 1 probe revealed that comet Borrelly’s surface reflects about 3% of the light that falls on it from the Sun, and is therefore much darker than asphalt that reflects 7% of incident light. Comet Borrelly photographed by the Deep Space 1 probe. When a comet travelling along its orbit moves close to the Sun, the outer icey layers begin to sublimate, in other words, they change from the solid to the gaseous state without passing through the liquid phase. The streams of dust and gas released form a thick, but tenuous atmosphere around the nucleus, called a coma, and a tail that points away from the Sun. The coma and tail become bright due to reflected sunlight and the ionisation of gases, which are an effect of the solar wind. The coma can be as big as the Sun. Comets always have two separate tails, one due to the dust and the other due to the gases. Dust, which is heavier than gas, creates a slightly curved tail respect to the direction of the nucleus; gas, lighter and more easily affected by the solar wind, produces a straight tail, which points away from the Sun. Depending on the Earth/comet configuration, at times the two tails seem to move in opposite directions with respect to the nucleus, at others the dust tail seems to develop on both sides respect to the nucleus (the anti-tail). Tails can reach enormous lengths, even greater than 1 astronomical unit. In 2006, seven articles were published on Science magazine regarding the announcement of the discovery, by the Stardust spacecraft, of long organic molecules in the dust particles of the tail of comet Wild 2. These particles, whose size was around 100 micrometres, were captured with an ingenious method: the Stardust space probe had a particular filter made up of aerogel, a porous substance, also known as ‘blue smoke’, capable of trapping the microscopic cometary dust particles. This discovery could be evidence in support of the famous panspermia theory according to which life on Earth had an extra-terrestrial origin, since organic molecules, which are the building blocks of life, could have been brought to Earth on comets. The panspermia theory is able to explain how life on Earth developed so quickly, as can be seen in fossilised stromatolites, or bacterial aggregates, dating back 3.8 billion years. It is believed that life appeared about 500 million years after the formation of the oldest rocks found on Earth (dating back 4.3 billion years). 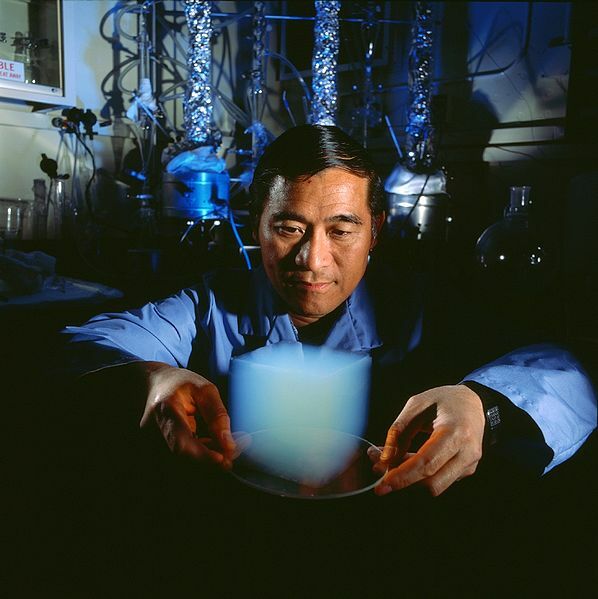 Some scientists claim that this lapse of time would have been too short for Earth to cool down and allow water to exist in its liquid state, a prerequisite for life. According to the panspermia theory, germs of life are scattered throughout the Universe, hence it cannot be excluded that this same phenomenon could have occurred on other planets, in other planetary systems. The discovery of the presence of organic molecules in the tail of the comet Wild 2 has given greater importance and increased the expectations of the European space mission, Rosetta, which is travelling towards the comet 67 P/Churyumov- Gerasimenko, which it will reach in 2014. Rosetta will be the first mission capable of making a lander (called Philae) descend on the surface of a comet. The Rosetta spacecraft and its lander Philae on arrival on the comet 67P/Churyumov-Gerasimenko. 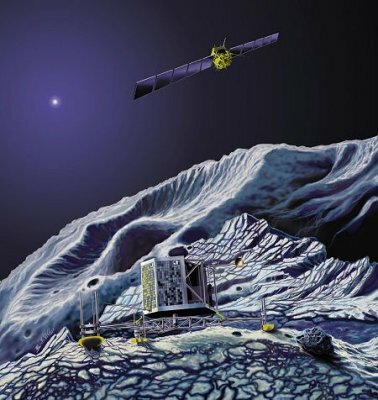 Philae will dig deep into the ice and will analyse the extracted material in situ in order to determine the exact chemical composition of the nucleus. There are going to be many surprises, it is just a matter of time! As comets orbit the Sun, their tails always point away from the Sun. In 1950, the German scientist Ludwig Biermann explained that this occurred due to the solar wind, a constant stream of charged particles, called plasma, released by the Sun, and capable of pushing the iced particles of the comet away, forming the tail. 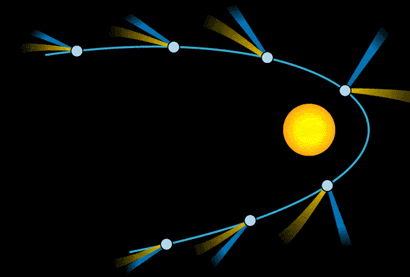 If the intensity of the solar wind increases, a disconnection event might occur, in which a part of the tail breaks off and is lost in space. This phenomenon is not at all rare: the most famous event was observed by the STEREO spacecraft, when the tail of Encke’s comet was severed by a coronal mass ejection originating from the Sun. Edited by Simona Romaniello Astrophysicist and science populariser, Ms Romaniello is responsible for formation and development and the installation of museum exhibits for the Turin Planetarium.